Today, Canon announced its new big sensor, compact fixed-lens G1 X. It’s a major step for the brand, which has been noticeably quiet when it comes to competing in this developing and difficult to define market. But Canon wasn’t alone: Fujifilm also unveiled its X-Pro 1, an ICL device that adopts the aesthetics of the X-series while improving on its technology. However it’s not the X-Pro 1 that the G1 X has to contend with–it’s the X10. 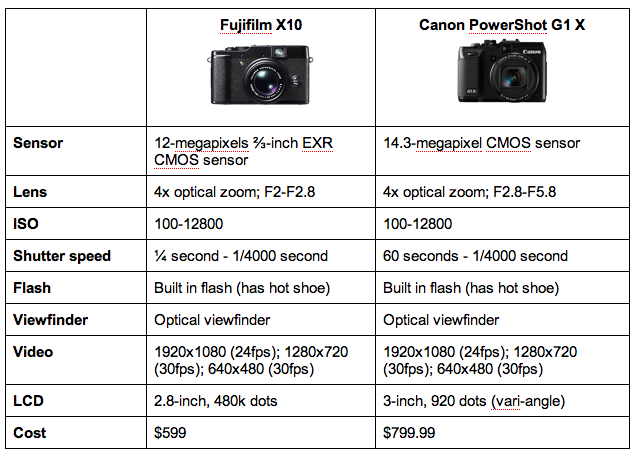 Fujifilm’s successor to the X100 has more than a few things in common with the new Canon release, and buyers will likely be pitting the two against each other. Here’s a quick breakdown of the two (images are not true to size).